Research firm Newzoo has released its quarterly update for the Global Games Market Report, revealing that mobile gaming, for the first time, is expected to take a larger share than PC gaming with $36.9 billion in revenues in 2016, up 21.3 percent overall. 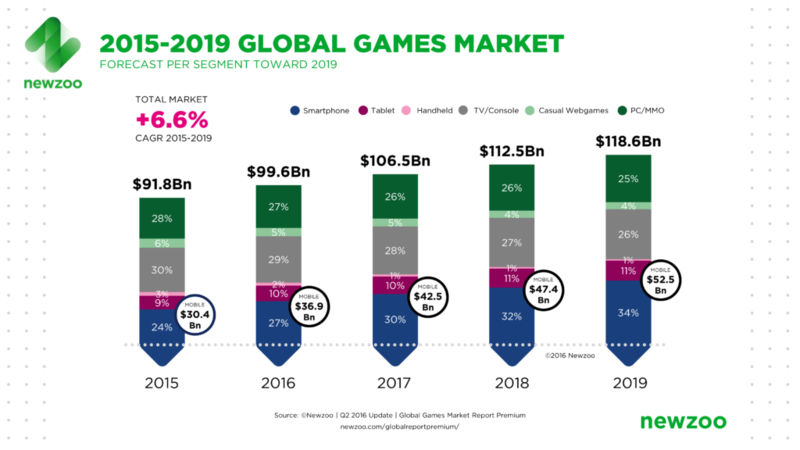 The entire global games market is forecast to reach $99.6 billion this year, representing 8.5 percent game industry growth Newzoo says. Mobile gaming's torrid pace is expected to continue. By 2019 the global games market should reach $118.6 billion with mobile gaming accounting for almost half that total at $52.5 billion, Newzoo predicts. 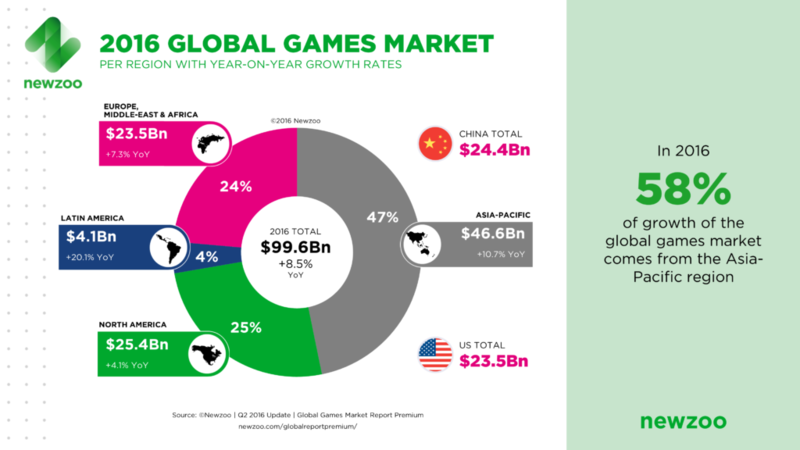 The lion's share of global games revenues are coming from Asia-Pacific (APAC) markets. In 2016, APAC accounts for 47 percent of the market, with China alone responsible for one quarter of all global game revenues. China's importance to the global market can't be stressed enough. With $24.4 billion expected this year, China will "cement its place as the largest games market in the world, ahead of the US's anticipated market size of $23.5 billion," Newzoo notes. "China's PC market is showing signs of slowing growth, with a 4 percent increase compared to the previous 16 percent as the success of 'core' mobile titles is starting to cannibalize PC game spending. However, the mobile segment in China is growing even faster than estimated and will reach $10.0 billion this year, up 41 percent from $7.1 billion in 2015. China will remain the largest games market for the foreseeable future, growing to $28.9 billion by 2019." Importantly, while everyone's buzzing about virtual reality right now, Newzoo believes total game software revenues from VR to "remain marginal for the near future and to largely substitute other game spending on console, PC and mobile."